"Somebody's in for a treat with this pure air!" said one of the two air entrepreneurs. According to Business Insider, Melanie and Francesca De Watts harvest fresh air from the English countryside, bottle it, and sell it to China as heavy smog shrouded the place and wherein the smog is so serious that people are unwilling to go outside. These bottles of fresh air cost $115 each. 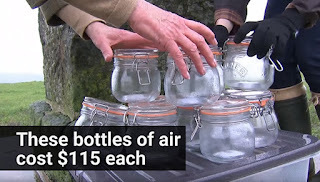 They harvest air using nets and each jar is different as, according to them, "some of the wind might pick up different notes of grass or near the sea it will pick up some saltiness in it as well." They also stated that they had already sold over a hundred bottles. Would you buy a glass bottle of air for $115 (approximately Php 5,500)?